Culberson County-Allamoore Independent School District, extended their deepest gratitude this week to Chevron for a check of $75,000 in support of the district’s new Science, Technology, Engineering and Math (STEM) initiatives and teacher training. Received through a Chevron program named “The Chevron Way”, the gift is an expression of the company’s beliefs and aspirations for themselves and all who interact with the company. Part of the values Chevron practices is partnerships that build trust and mutually beneficial relationships with communities and governments. Chevron believes that they are most successful when their partners succeed with them. CCAISD has embarked on a journey to evolve as an educational institution resulting in a system through which students graduate with an associate’s degree and industry certifications through newly formed STEM Academies. Chevron’s significant contribution, according to district leaders, “comes at an important time as we plan and implement the programs for our STEM Academies. 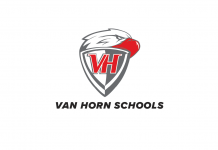 As a community that recognizes the value of a quality education, Van Horn is building a new 21st Century public school facility. In concert with the community’s commitment, Culberson County-Allamoore ISD is designing an educational program to meet 21st Century job needs for optimum student outcomes that the district has named “The Van Horn Vision.” This educational program will enable all students to graduate with an associate’s degree and STEM-driven industry certifications that will equip them for success in an increasingly technological world. CCAISD has taken, as a case study, the Roscoe Collegiate Independent School District. Roscoe has created a model of success for their students called the P-20 educational model. This model implements strategies and programs with a goal of considering the educational success of every student from their earliest years in Pre-Kindergarten all the way through their completion of a Ph.D.
CCAISD is interested in emulating the Roscoe model, crafting it to the vocational and trade specific needs and resources unique to this region. The local district is particularly interested in Roscoe’s successful Edu-Drone program. The Roscoe district has written a Drone-Airborne Innovation curriculum which is being marketed and sold by Office Depot. Graduates from the Edu-Drone Academy are prepared to become entrepreneurs and are work-force ready in the industry of Unmanned Aircraft systems. Roscoe Collegiate ISD’s students receive their FAA Drone Certification. This and other innovative STEM programs are implemented at RCISD. Numerous community members have traveled to Roscoe to see and learn of these programs. Blue Origin staff, the President of Navigator Oil and Minerals, Van Horn State Bank staff, and other community members are examples of those who have joined school administrators and school board members to see the P-20 RCISD model. The CCAISD staff will be making a trip on February 16, 2018 to view the school and experience Roscoe’s educational model first hand.